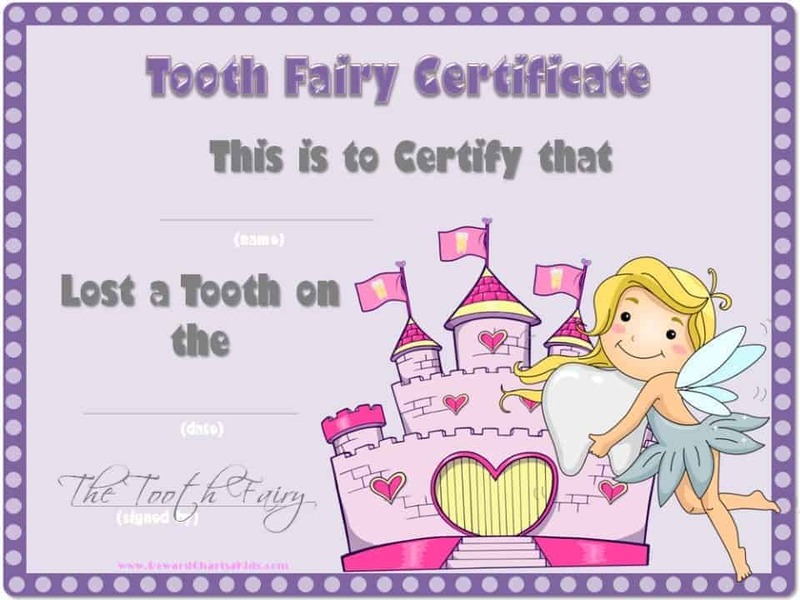 The following Tooth Fairy Certificates can be downloaded and printed free of charge. You can even personalize each certificate! The following tooth fairy certificates open in PDF format. If you cannot open a PDF file you can download Adobe Reader here. Children typically lose their baby teeth at around age 6 or 7. This is an exciting time for both children and parents. According to the myth, when kids lose their teeth they leave them under their pillow and the tooth fairy comes to get them. In return the tooth fairy leaves a reward of some sort. It can be money or a gift. 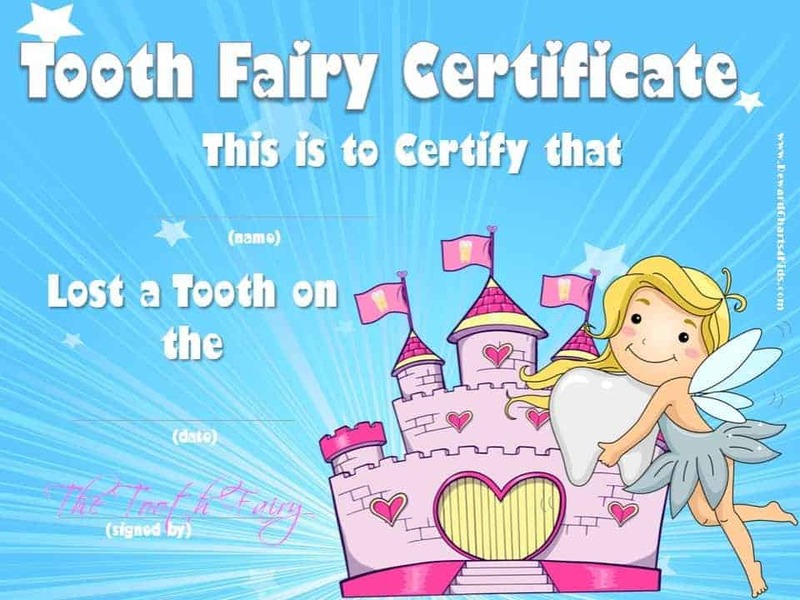 Here are some ideas on various ways to honor the tooth fairy tradition, add some fairy magic and celebrate losing a tooth. Don’t forget to encourage your child to take good care of his teeth! In fact, in addition to anything you decide to do you can also leave a new tooth brush and tooth paste. Keep track of when your child loses her teeth. 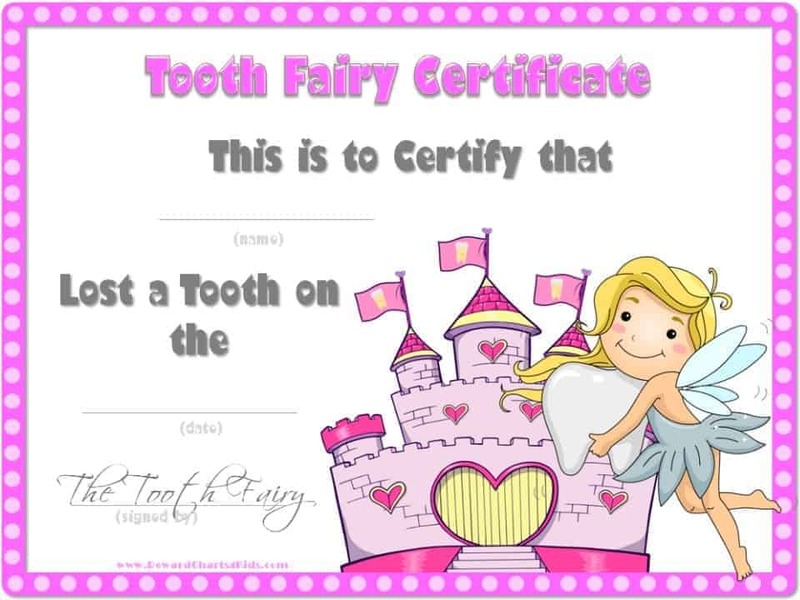 You can either use a tooth chart, or just keep a copy of the certificates or letters that she gets from the tooth fairy. If you are trying to teach your child the value of giving to others and/or saving then you can give three notes. One to be spent, one to be saved and one to be donated to charity. Print out and sign a tooth fairy certificate (there are a selection of free printable tooth fairy certificates above). You can even have it laminated if you have the time. Don’t forget to add the date so that you can keep the certificate for when your child is older. And in case you are wondering, no, it will probably not be sufficient and you will need to attach a gift or money. For those of you who do not want to start this tradition or don’t believe in giving money you can just prepare the certificate. 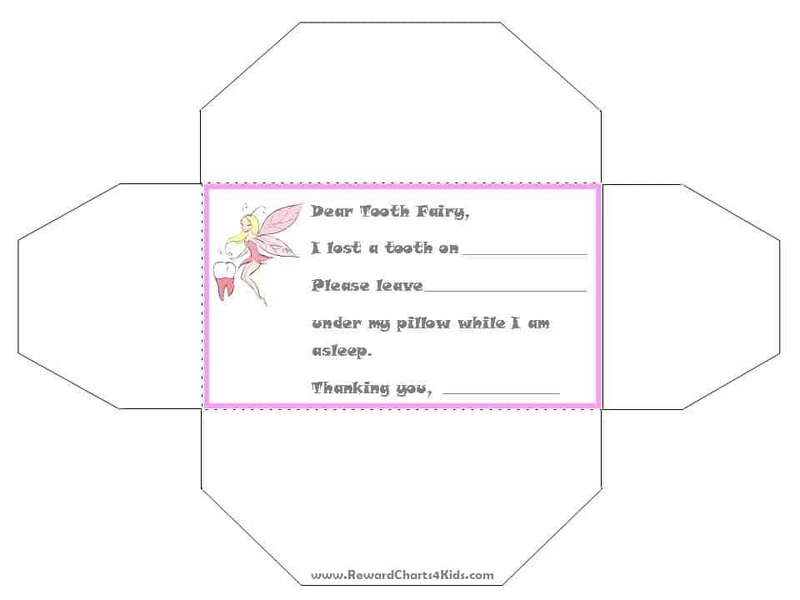 This tooth fairy envelope has place to add the date that your child lost her tooth and the gift that she would like the tooth fairy to bring her as a result. Print out the template, cut it out and fold it to make the envelope. Insert the tooth and have your child fill in the details. Don’t forget to leave it somewhere that the tooth fairy will be sure to find! 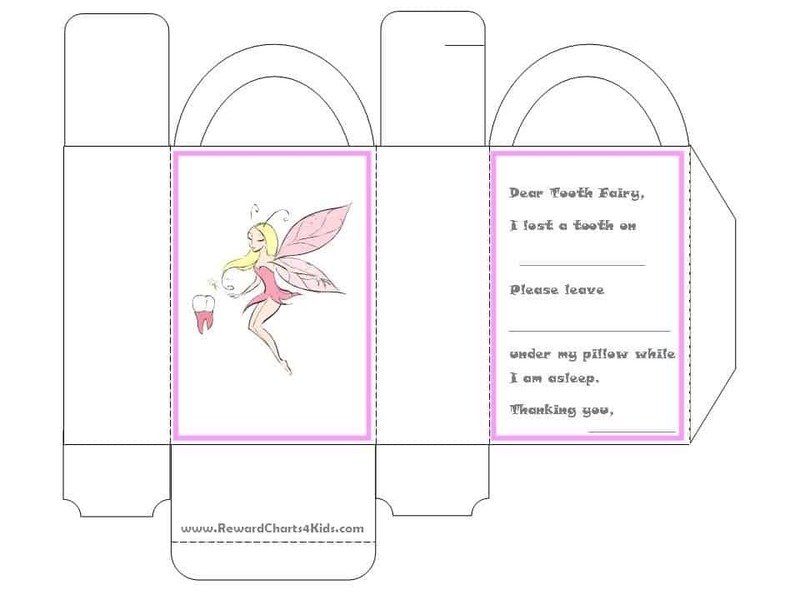 Print out this tooth fairy box template on colored card stock, cut on the solid lines and fold the box. Leave the tooth in the box with the letter to the tooth fairy and in the morning there will be a surprise in the box instead of the tooth! You could sprinkle some glitter (fairy dust) next to the window and around your child’s room to leave a trail that the tooth fairy supposedly left when she came in at night. Some kids enjoy this but parents don’t as much since the glitter always seems to get everywhere. Take a small pillow, cut out a tooth shape from felt and sew it on the pillow. Leave the top side of the tooth open. Ask your child to leave her tooth in the felt tooth. 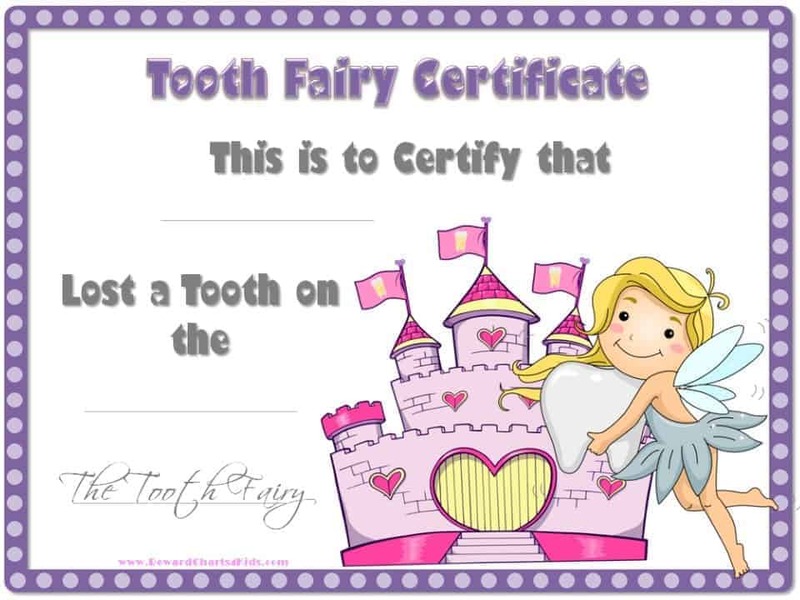 The tooth fairy will be sure to take the tooth out and replace it with money or a gift voucher. “She” could write a note with a special surprise such as you are entitled to the ice cream of your choice if you prefer not to leave money. Fill a jar with water and ask your child to leave her tooth in the glass. Once your child falls asleep take out the tooth and instead add some food coloring and glitter. Make a little tooth or a little fairy out of sugar paste. Bake and decorate a cupcake and place the tooth or sugar paste fairy in the middle. You can also just buy a small plastic fairy if you don’t have the time or patience to make one. Buy or make a small drawstring bag or box. Ask your child to leave her tooth there so that the tooth fairy can replace it with money. This depends on the Tooth Fairy. Some fairies leave a dollar and some leave up to $10. Hi I just printed the pink certificate!! !thank you very much. It made the whole experience a lot more bright!! !